Mark Twain, arguably America’s best-loved and well known author, is familiar to most readers in his Hal Holbrook incarnation as a dyspeptic old gent in a white suit, spouting homilies from his stately porch in New England while waving a premium cigar. Yet Samuel Clemens had an entirely different sort of life when he was a young man honing his writing craft on bartops in Nevada and San Francisco saloons, on dusty desktops in boomtown newspaper offices, and in the unmentionable haunts of California’s Barbary Coast. This West Coast “lost decade” of Twain’s is the focus of The Sagebrush Bohemian, Nigey Lennon’s eminently readable yet painstakingly researched biography. 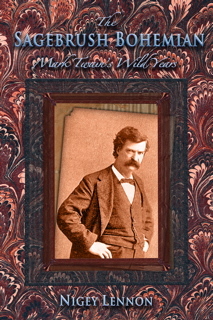 Despite the torrent of “new” publications about Twain which never seems to abate, The Sagebrush Bohemian remains one book which imparts fresh insights in a rollicking, humorous style reminiscent of its subject’s. Note: This title is also available in many formats from numerous other e-retailers who sell e-books.